1/12th scale for your dollshouse. , An oval , metal platter with a wonderful selection of Seafood for your table or party. 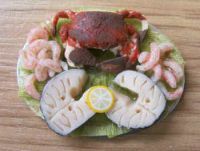 , Contains Crab, Salmon Steaks and Prawns on a bed of Lettuce, and garnished with lemon slice.